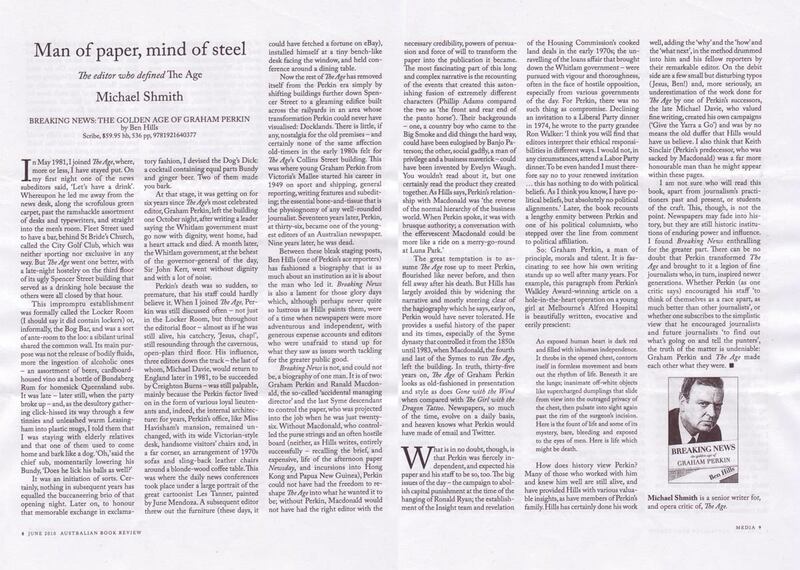 Some may think that this was a peculiar time to be writing a book about a newspaperman, when the devastation of the Great Recession and the tectonic shift of news and advertising to the internet are causing the greatest upheaval in the information industry since Caxton put the town-cryer out of business. Scores of newspapers, some of which have been around for more than a century, have closed, and around the world thousands of journalists have lost their jobs. 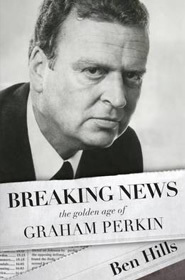 But Graham Perkin was no ordinary newspaperman. Few would challenge him as the greatest Australian editor of his generation, if not the 20th century. He took a venerable but moribund Tory broadsheet and transformed it into one of the most successful, profitable and influential papers in the country. It was, in many ways, a golden age. He propelled an obscure provincial journal published out of a Dickensian rat’s nest in Melbourne into the ranks of the world’s top 10 newspapers, alongside such great titles as The Washington Post and The Times of London. He changed for ever the way Australian newspapers look at the world, and what the public expects of its newspapers. It is almost 35 years since this big, bluff cyclone of a man was cut down by a heart attack, but many of the innovations he brought to The Age have become part of the fabric of the Australian media. His ground-breaking use of investigative journalism put law-breakers behind bars and helped bring down governments. “If there’s muck there to be raked it’s a newspaper’s responsibility to get in and rake it,” he proclaimed. He enlarged the scope of newsgathering to include, for the first time, what today are mainstream issues: the environment, social welfare, health, science and higher education. His courageous campaigns on social issues, from the abolition of capital punishment to reducing the road toll to recognition of the rights of the intellectually handicapped helped reshape society. He fought like a lion wherever he saw the freedom of the press under threat, campaigning for the reform of defamation and other laws which, he said, gave Australia “a quarter free press” which could not have reported Watergate. He made his newspaper look more like the world it was reporting – he employed the first non-English language journalist to work for any major newspaper, some of the first graduates, some of the first women to toil in a newsroom over more than knitting patterns and fruit-cake recipes. 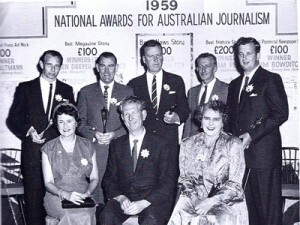 Perkin’s Age became a hot-house of talent, winning more journalistic honours than any other paper, and producing some of the greatest characters and the biggest names in the media, among them the TV current affairs stars Michael Willessee and Jennifer Byrne, Melbourne’s top-rating radio show host Neil Mitchell, the doyenne of Canberra political correspondents, Michelle Grattan, the acclaimed novelist Robert Drewe and the authors Les Carlyon and Roland Perry. Perkin was a transitional, and a transformational, figure in the history of the media in this country. He was appointed in the twilight of the Menzies era, when memories of World War II and the Depression were still vivid, when the Cold War had realigned the axis of global politics and a hot war was raging in Vietnam, England was still ‘the Old Country’ and Australia’s biggest trading partner, and Australia had little local art, drama or literature. Hanging was the penalty for murder, homosexuals were pursued by the Vice Squad and imprisoned, and the pubs shut at 6 pm. He died as the first Labor government in a generation was in its death throes, Australia’s trade and diplomatic focus had switched to Asia and Melbourne was morphing into the vibrant, multicultural city it is today. His own industry, publishing, was on the cusp of its greatest transformation in almost a century, and I have tried to paint a picture of the now-vanished realm of “hot metal” production over which he presided, where printers pelted ‘slugs’ of type-metal at the rats that ran along the rafters. Perkin instinctively read the mood of that turbulent decade, and his paper led the way in explaining the social revolution to a new generation of readers. This is a biography, but it also looks at the history of the paper, founded more than 150 years ago by the firebrand Scottish reformer David Syme, and the ultimately unsuccessful struggle to maintain its independence. It examines the concept of ‘editorial independence’ – the relationship between an editor and his proprietor – and assesses the importance of Ranald Macdonald, the last of the Syme dynasty to manage The Age, in protecting Perkin from the wrath of a reactionary board. It looks (briefly) at the future of newspapers in the internet age. 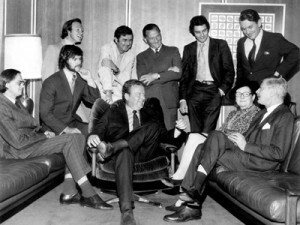 But most of all this is a portrait of media power, of the last of the great editors who by the force of their convictions made a difference to society – a breed for whom there is no place in today’s corporate media conglomerates, with their focus on cost-cutting and the short-term bottom line. A big, dominating man with bulging blue eyes, tight golden curls and a natty dress sense, when he moved to Melbourne Perkin soon showed that he was the outstanding talent in town – he could cover anything, from the nuclear tests at Maralinga to the war in Vietnam to bearing eye-witness to an open-heart operation, a report which won him a Walkley Award, Australian journalism’s Pulitzer Prize. Fast-tracked into the editor’s chair at the almost-unprecedented age of 36 he found himself at the helm of a fusty, conservative institution that had barely got used to having news on the front page. Its circulation was dwindling, it was on the brink of bankruptcy, and its management, descendants of David Syme, were in their dotage. A prodigious worker – he used to get by on four hours of sleep a night – who devoured with equal gusto his roast beef, red wine and Camel cigarettes, within a few years Perkin had resuscitated the paper. His tragically premature death at the age of 45 deprived Fairfax, who by now owned The Age, of a fine executive – the day he died he was due in Sydney to take the job of chief executive of that great publishing house. And it took the wind out of the sails of The Age – within five years the paper began an inexorable decline. So we know the ‘what’ and the ‘when’ and the ‘where’ of his copiously-documented life. But Graham Perkin’s great insight, what made his newspaper one of the best in the world, was his understanding that the young, educated baby-boomer readers raising their 3.5 children out in the new suburbs expected more than that, more than their parents and grandparents had. The bare-bones facts they could get from the TV any night. What Perkin drummed into his reporters was that The Age should strive to give them something more in the morning: to place the news in a context, to explain its significance, to provide a critical commentary, to add the ‘why’ and the ‘how’ and the ‘what next?’ This is what I have tried to do with this book. Every day working with Perkin, as one of his editors told me, was like batting with Bradman. Breaking News – the Golden Age of Graham Perkin, won an Alex Buzo prize for authors short-listed for the Copyright Agency Ltd/Waverley Library award for excellence in research in 2010. There were 159 entries, including books by Tom Keneally, Peter Carey, Ross Fitzgerald and Barry Humphries. Congratulations to Andrew Tink for winning the award (and $20,000) for his biography of William Charles Wentworth. Breaking News was one of nine books long-listed for the 2010 Walkley Awards out of 58 entries. Congratulations to the three shortlisted authors: Paul Kelly for The March of the Patriots: The Struggle for Modern Australia, Chris Hammer for The River: A Journey Through the Murray-Darling Basin and to the winner, Shirley Shackleton, for The Circle of Silence: A Personal Testimony Before, During and After Balibo.